KENNESAW – Do you really value your professional and personal relationships? 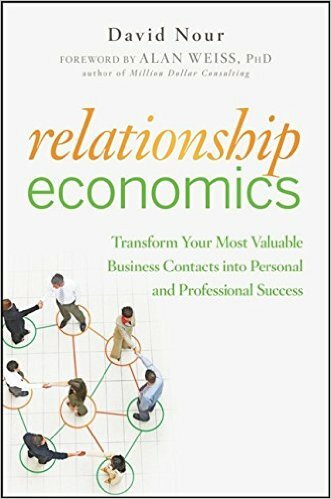 I had an opportunity to meet David Nour, www.davidnour.com in 2010 to discuss his book, Relationship Economics (Amazon). Not only was David fascinating to talk to, but his application of social media to promote his activities and capabilities is spectacular. He argues that all relationships have value, either positive or negative. Inventory your relationships and make the most of the positive ones in your life. Relationships become the human capital of our lives and either make us stronger or weaker, richer or poorer. Nurturing good relationships and shedding bad ones should become second nature to us. If you want to reach the next level in your personal and business life, then invest in good relationships. Give of yourself to help others be successful and it will return huge benefits, not only to you, but to the world. This becomes the foundation for the 80/20 lifestyle. Twenty percent of the relationships of our lives determine eighty percent of our life’s outcome. Focus on strengthening the good relationships in our business and personal lives and shedding the bad ones. It shouldn’t be hard determining which ones are which. Encourage Excellence today with one of your close friends.